Why Walk In Her Shoes? 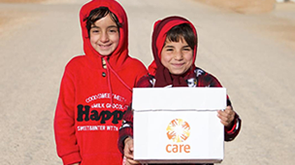 CARE started working in Serbia in 1993, providing humanitarian aid for refugees and people affected by conflict. We now seek to build sustainable peace and development in the region, through activities to improve incomes, encourage reconciliation, integrate minorities and create opportunities for young people, women and girls. Serbia’s Roma minority is extremely marginalised. In partnership with local organisations, we help Roma girls gain access to education and stay in school. We also work to identify and address social and gender-based barriers to health services. We work in 79 developing countries, saving lives in emergencies and finding long-term solutions to poverty for millions of people every year. Founded in 1945 to send 'CARE packages' to people recovering from war, we have been fighting poverty in the world’s poorest countries for 70 years. We empower women and girls to fulfil their potential – because when one woman is helped out of poverty, she brings her family and community with her. Your support is what makes our poverty-fighting work possible. You can trust us to spend our funds wisely and effectively to help people in need.